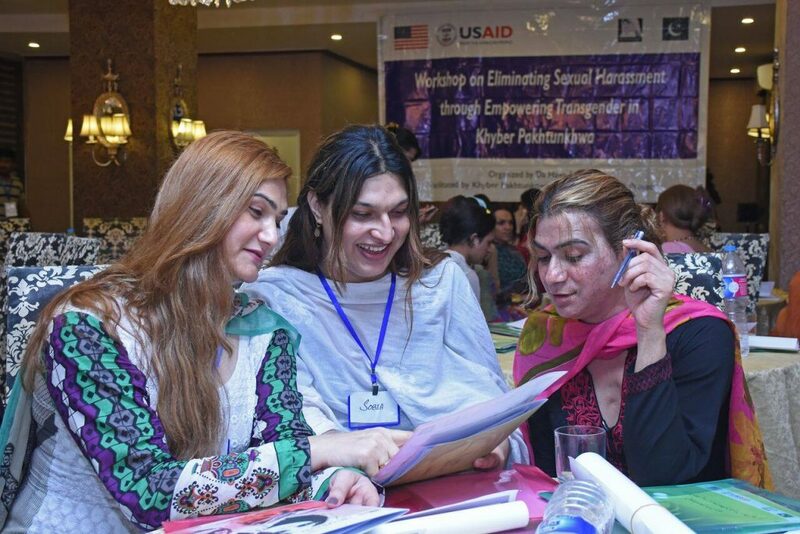 ISLAMABAD :August 8, 2017-Local NGO held a training workshop for transgender community with topic of ‘’Eliminating Sexual Harassment through Empowering Transgender in Peshawar Khyber Pakhtunkhwa’’ at 7-8 august 2017 in local hotel at Peshawar. Director Programs local NGO (Da Hawwa Lur organization) Mis.Shawana Shah said that “Da Hawwa Lur” is thankful to USAID Khyber Pakhtunkhwa Governance Project and American people for the generous support to ensure the development and equal rights of transgender in Khyber Pakhtunkhwa. The event spanned over two days which covered all aspects such as the fundamental human rights in the constitution of Pakistan, anti-sexual harassment legislation 2010, KP Right to Information Act and KP Right to Services Act and other steps taken by Government of Pakistan for the development of transgender. The training was attended by transgender community, media persons, and representatives from education and health department and civil society organizations.At the conclusion of the event certificates were distributed among the participants and recommendation were taken from transgender about the developmental plans they need the most for their community.